Scenario Description: The great warlord Toyotomi Hideyoshi has unified Japan. To keep his Samurai busy, his eye now turns west to Korea. Will he be able to expand his empire? Or will Korea's Chinese allies arrive in time? 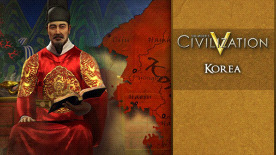 Play as one of four Civilizations: Korea, China, Manchuria, or Japan. Sejong the Great (1397-1450 AD): The fourth king of the Choson Dynasty of Korea, and considered by many to be the greatest king in Korean history. His reign was marked by his deep care for his people’s welfare and his encouragement of sciences and technology. He is credited with the creation of the Korean written language.